Recently we were invited along for any little child's dream experience...we were asked to visit Peppa Pig World which is located within Paultons Park for the launch of their two brand new rides; Grampy Rabbit's Sailing Club and The Queens Flying Coach ride! Needless to say Pickle was beyond excited and when we arrived at the park it was like all of his Christmases had come at once! The new rides are located in Peppa Pig world and, like the whole of the rest of the park, are so perfectly themed. 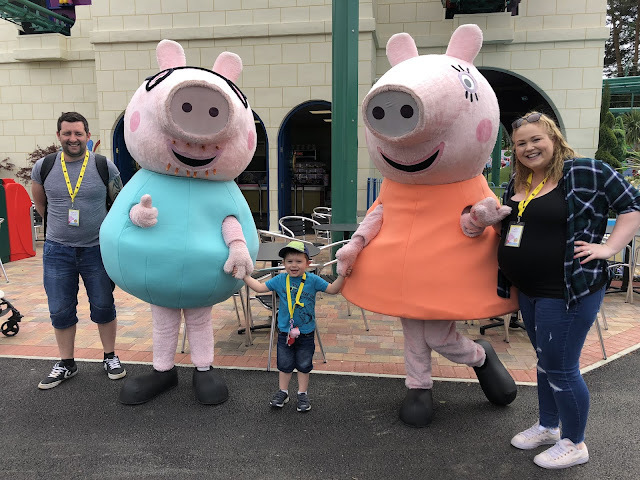 All of the rides in Peppa Pig world are designed for all the family to enjoy which meant that Pickle was never scared or overwhelmed as all the rides were gentle and welcoming and all of the rides were suitable for young, old and even pregnant like me!! Not only were we able to try out the new rides (check out the video at the start of this post to see how amazing they are!) but we also had the chance to meet all of the Pig family. Pickle has not stopped talking about meeting Peppa, George and Mummy and Daddy Pig since we have been back. Watching his face light up when he saw them made my heart swell! If you're a parent then you will know that there is nothing better than seeing your child in their element and Pickle definitely was! Note: We were asked to attend this event but all opinion expressed are honest and my own. Oh it looks like you had such a fab day! Lily has outgrown Peppa now so wasn't interested in going! Isn’t so lovely when kids get to meet the characters isn’t it? Glad you had a lovely day. Ahhh this looks AMAZING! We have been dying to go there for the longest time - my daughter is a massive fan and would be in absolute heaven! This looks like a lot of fun, especially for the kids! Glad you all had a nice time. Oh we really want to visit Peppa Pig World. I've two year old twins and I think they'd love it. It sounds great. I'm hoping we get there soon! We've yet to visit peppa pig world. I think Blake would love it though. The new rides sound such fun! Ahhh it looks amazing, glad you guys had a lovely day. Oh wow this looks like so much fun! We didn't manage to make it - gutted!!! My niece absolutely loves Peppa Pig, she would adore this! Aw it is so nice that you were able to go to Peppa Pig World and see the new rides. I have heard that the rides are top notch for kids! Oh wow this looks incredible! My daughter would love a visit, I will have to see about planning a trip! I did not even know Peppa pig world was a thing! How fun! I am so, so, so jealous! I love the look of all the new rides. We're heading up that way for a mini break soon and this is the first place I'm taking my four year old. Sounds like you had a great time there. I've heard and read great things about Peppa Pig World and that even non-fans will enjoy it!